Working in ‘brand space’ has always been fascinating but in the last few years the speed of change in technology and its impact on customer’s expectations has given rise to a preponderance of businesses that are potentially either digital ‘victims’ or digital ‘Victors’. Clients that come knocking at our door are often either incumbent businesses, striving to grow, retain and protect what they have, or are start-up upstarts looking to reinvent the value proposition in a product or service sector. Often the mindsets in these two businesses are poles apart. One sometimes risk averse and ponderous, the other agile, bright and sometimes shallow in experience. It’s intriguing and I have often wondered why ‘big brands’ with all their smarts and deeper pockets fail to grasp their role as ‘market makers and innovators’. I think there is still a legacy ‘systemic’ issue of a brand management structure that rewards custodianship rather than creativity but I think it also goes deeper than this. Management also has a short-term ‘denial’ perspective that counters mid-term risk taking, even though disruption is clearly on the horizon. Many successful organisations fail to look for new things their customers want because they’re afraid to hurt their core businesses. This has been called the innovators dilemma (1). An inertia caused by the risk of the unknown and the fear that the distraction of focusing on the horizon will lead to a lack of focus on near term sales and revenue plans. The interesting model below from McKinsey clearly illustrates the point where an incumbent’s existing business model, for a short-time, out performs the theoretical new model. Adapting to market change has created some stagnation in growth but in the longer-term has ensured the sustainability of the business. Kodak and Blockbuster are good examples of businesses that succumbed to a period of myopia, ignored the inevitable digital disruption and failed to adapt as a result. Change is always inevitable but for many large businesses with legacy systems and cultures , in particular, the speed of change facilitated by tech driven disruption has been difficult to contend with. Jo Cauldron and Dado Van Peterghem identified 10 hyper-disruptive business models that have had, or are having, an impact on established incumbent businesses. • The Subscription Model (Netflix, Dollar Shave Club, Apple Music) Disrupts through 'lock-in' by taking a product or service that is traditionally purchased on an ad hoc basis, and locking-in repeat custom by charging a subscription fee for continued access to the product/service. There has been a massive growth in subscription model businesses in the service and ecommerce sectors. In the USA there are over 10,000 subscription box businesses and this trend is growing in the UK/Europe. The subscription commerce industry is estimated to be growing at a rate of 200% a year, generating $5 billion in revenue in 2014. The Honest Company, Jessica Alba’s subscription company is valued at more than $1.4 Billion. • The Freemium Model (Spotify, LinkedIn, Dropbox) Disrupts through digital sampling, where users pay for a basic service or product with their data or ‘eyeballs’, rather than money, and then charging to upgrade to the full offer. Works where marginal cost for extra units and distribution are lower than advertising revenue or the sale of personal data. • The Free Model (Google, Facebook) Disrupts with an ‘if-you’re-not-paying-for-the-product-you-are-the-product’ model that involves selling personal data or ‘advertising eyeballs’ harvested by offering consumers a ‘free’ product or service that captures their data/attention. • The Marketplace Model (eBay, iTunes, App Store, Uber, AirBnB) Disrupts with the provision of a digital marketplace that brings together buyers and sellers directly, in return for a transaction or placement fee or commission. • The Access-over-Ownership Model (Zipcar, Peerbuy, AirBnB) Disrupts by providing temporary access to goods and services traditionally only available through purchase. Includes ‘Sharing Economy’ disruptors, which takes a commission from people monetising their assets (home, car, capital) by lending them to ‘borrowers’. • The Hypermarket Model (Amazon, Apple) Disrupts by ‘brand bombing’ using sheer market power and scale to crush competition, often by selling below cost price. • The Experience Model (Tesla, Apple) Disrupts by providing a superior experience, for which people are prepared to pay. • The Pyramid Model (Amazon, Microsoft, Dropbox) Disrupts by recruiting an army of resellers and affiliates who are often paid on a commission-only model. • The On-Demand Model (Uber, Operator, Taskrabbit) Disrupts by monetising time and selling instant-access at a premium. Includes taking a commission from people with money but no time who pay for goods and services delivered or fulfilled by people with time but no money. • The Ecosystem Model (Apple, Google) Disrupts by selling an interlocking and interdependent suite of products and services that increase in value as more are purchased. Creates consumer dependency. Countering these new models, that ultimately provide a consumer benefit is difficult. The traditional block strategies of scale dominance where big companies have been able to close rank around their customers or even buy the competition has often proven to be short-term pain-relief. New competitors arise, or customers with greater market transparency, quickly find ways to circumvent marketing, legal and regulatory blocking strategies to erode ‘brand premiums’. As well as closing ranks, here are some other strategies often used in response to ‘disruptive’ new models. • The Milk Strategy. Extracting the most value possible from vulnerable businesses while preparing for the inevitable disruption. • The Invest in Disruption Model. Actively investing in the disruptive threat, including disruptive technologies, human capabilities, digitised processes, or perhaps collaborating and investing in start-ups to fast-track these attributes. • The Disrupt the Current Business Strategy. Launching a new product or service that competes directly with the disruptor, and leveraging inherent strengths such as size, market knowledge, distribution strengths, brand, access to capital, and relationships to build the new business. • The Retreat into a Strategic Niche Strategy. Focusing on a profitable niche segment of the core market where disruption is less likely to occur (e.g. travel agents focusing on corporate travel, and complex itineraries, book sellers and publishers focusing on academia niche). • The Redefine the Core Strategy. Building an entirely new business model, often in an adjacent industry where it is possible to leverage existing knowledge and capabilities (e.g. IBM to consulting, Fujifilm to cosmetics). • The Exit Strategy. Exiting the business entirely and returning capital to investors, ideally through a sale of the business while value still exists (e.g. MySpace selling itself to Newscorp). The choice of which strategy is most appropriate would depend on the scale and type of disruption. Fifteen years on from Clayton Christensen’s book on ’The Innovation Dilemma’ we are now in an era where ’sudden death’ from ‘Big Bang’ disruption can occur in months rather than years. An example is the launch of free navigation apps on phones which wiped out 85% of TomTom’s market capitalisation in two years. Not sudden death maybe but what will happen to insurance companies when human error is taken out of the equation and we are all driven around our roads by robots? "You can’t see big-bang disruption coming. You can’t stop it. You can’t overcome it. Old-style disruption posed the innovator’s dilemma. 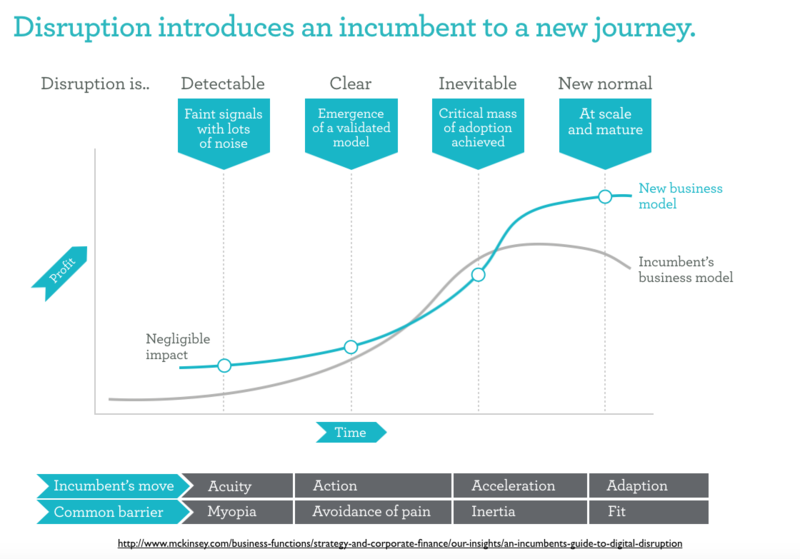 Big-bang disruption is the innovator’s disaster. And it will be keeping executives in every industry in a cold sweat for a long time to come." Big-Bang Disruption by Larry Downes and Paul Nunes HBR March 2013 (2). From the brand point of view this discussion about innovation and how to get on or ahead of the curve is really interesting. Its fascinating because The Allotment is on the curve consulting with businesses about change and transformation, and how they can create a salient brands that connect emotionally not just because of better this (widget) or that but because they have an intention or purpose that is profoundly believed and is believable. It often, in our minds comes back to ‘culture’. If your brand has a purpose that has your customer at its centre then surely creating and innovating with new ideas to improve their service or offer is a core business mandate. The best companies, in our experience, disrupt because they have creativity at their core of their brand. Google and Apple are obvious examples but also look at Coke whose success, in part, has to do with their marketing investment strategy. About 70% of their investment is in 'Now', or established and successful programs; 20% goes to 'new’, or emerging trends that are starting to gain traction; and 10% goes to 'next', ideas that are completely untested (3). Culture in our mind is the long-tail of sustainability and innovation. Get this right and you will see what is coming sooner and be able to react in an open-minded, responsive and agile way.